If you push a book on the surface of a table until the book is displaced, you are said to have done work on the book. If an object falls to the ground due to the pull of gravitational force, the gravitational force is said to have done work on the object. On the contrary, if you push an object with all your might to the point that you sweat profusely, but the object does not move at all, you are said to have done no work on the object. In everyday life, people might say that you have done hard work by pushing the object but in Physics, you did not do work on the object because there has been no displacement of the object. Work on an object can be done by a constant force (the amount and direction of which are constant) or variable force (the amount and direction of which vary). An instance of force with constant amount and direction is a gravitational force, which works on an object when the object is near the ground surface. When an object is in free fall near the ground surface, the amount and direction of the object’s free fall acceleration are constant because the amount and direction of the gravitational force accelerating the object are constant. An instance of force with an inconstant amount (but with a constant direction) is spring force. Another example is a rocket launched to space or returning to the earth’s surface. When a rocket is launched, the amount of gravitational force working on it changes in an inverse proportion to the square distance from the earth’s center. Mathematically, the work done by a constant force on an object is defined as displacement multiplied by force or component of force which has the same direction as the object’s displacement. Observe an object on the surface of a rough flat plane with displacement to the right caused by a thrust force (F). Figure 1. (Top) The direction of the object’s displacement is the same as force F. (Bottom) The direction of the object’s displacement is the same as the component of force F in a horizontal direction (F cos). Description: W = work, s = amount of displacement, θ = angle between force and displacement. (a) The object is in free fall. The weight is in the same direction as the displacement (b) The object moves vertically upwards. The weight’s direction is opposite to the displacement’s direction. In the previous instance, the work done by the weight (w) has a value of zero as the direction of the object’s weight is perpendicular to the direction of the object’s displacement. It should be noted that the work done by the weight will not have a value of zero if the direction of the weight is the same as or opposite to the direction of the object’s displacement. Description: w = weight (Newton), h = height (meter), m = mass (kg), g = gravitational acceleration (meter per square second). According to the previous explanation, the following conclusions are drawn: First, if an object does not experience any displacement, the force exerted on the object does not do any work. If s = 0, W = 0; Second, if a force forms a given angle against the displacement of an object, only the component of the force sharing the same direction as the object’s displacement does work on the object; Third, a force in a direction perpendicular to the direction of the displacement of an object will form an angle of 90o. Cos 90 = 0; Fourth, work may have a positive or negative sign. If the force is in the same direction as the object’s displacement and forms an angle of 0o, it does positive work on the object. Conversely, if the force has a direction opposite to the direction of the object’s displacement and forms an angle of 180o, it does negative work on the object. Figure 3. Force (F) – displacement (s) graph. Work is equal to the shaded area. The work done by a constant force on an object when the object is experiencing displacement is equal to the shaded area in the force (F) – position (s) graph. Work is denoted as W (uppercase), and weight is denoted as w (lowercase). The SI unit of work is the Newton ∙ meter (N m). It is equivalent to the Joule, abbreviated as J. It was named so to pay homage to a British physician of the 19th century, James Prescott Joule. An object is at rest on the surface of the frictionless floor. On the object is done a force of 10 N, forming a 30-degree angle against the floor. If the object moves 1 meter far, how much is the work done by the force on the object? A 0.2 kg coconut is in free fall from a height of 10 meters from above the ground. If the gravitational acceleration is 10 m/s2, how much work is done by weight on the coconut? W = work, x = Δx = spring deviation (meter), F = spring force (Newton). On a spring is suspended weight with a mass of 1 kg, so the spring extends by 2 cm. If the gravitational acceleration is 10 m/s2, determine (a) the spring constant (b) the work done by the spring force on the weight. Known: m = 1 kg, g = 10 m/s2, x = Δx = 2 cm = 0.02 m.
The work done by the spring force on the weight has a negative value as the direction of the spring force is opposite to the direction of the weight’s displacement (spring force is in up direction, weight is in down direction). If there is only one force that works on an object when the object is experiencing displacement, the work done by the net force equals to work done by the force. For instance, if an object is in free fall and the air restriction is ignored, the only force working on the object is gravitational force. In this case, the net force working on the object is the gravitational force (see figure 2). 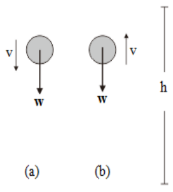 If some forces are working on an object when the object is experiencing displacement, the work done by the net force is equal to the net work done by all forces working on the object (see figure 1). The work done by the net force on an object can also be calculated by finding the net force first and then multiplying it with the amount of displacement. A stationary box on floor surface is pushed with a force of 20 N until the box moves 1 meter far. 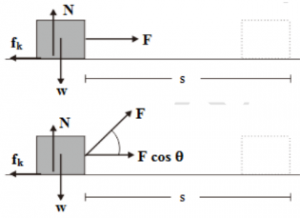 If the thrust force is in the same direction as the box’s displacement and on the box works a kinetic frictional force of 2 N, determine the amount of net work done by the net force on the box.